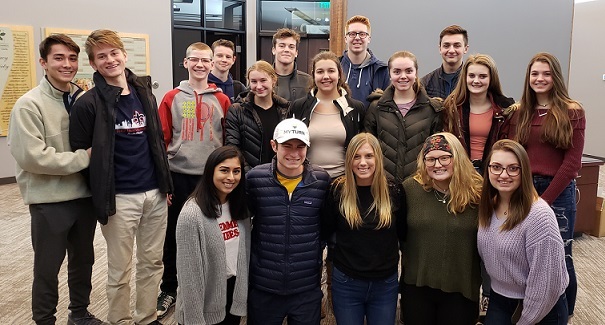 The Youth Advisory Council (YAC) of the Community Foundation recently approved new Strategic Priorities that will guide their grant making in 2019-2021. YAC President, Delaney Ward, said “We put a lot of time and effort into making sure as many high school and middle school voices around the County were heard during our survey process.” This was the first year that the YAC survey included middle school students. Every three years YAC reviews their priority areas and reach out to students in the County for feedback and input on their needs. Programs concerning mental health issues such as depression, anxiety, suicide, self-harm, self-esteem, stress, alcoholism, substance abuse and other issues relating to the mental well-being of youth in the area. Programs related to the enhancement of sports, clubs, and extracurricular programs with a focus on the prevention of bullying and programs that bring awareness to violence in schools. In addition, the YAC will place specific emphasis on pathways to careers in trade, college, and career readiness, as well as life skills. Programs that seek to minimize domestic issues and violence. We also seek to promote physical health and time management skills. YAC’s core mission is to better St. Clair County youth through educating them about philanthropy, charity work and objective thinking. The group was extremely pleased and grateful that so many school districts were supportive of their efforts to receive an accurate representation of the needs of our youth in our community. After much debate and discussion over the feedback received, the new priority areas best reflect the current needs of the youth in St Clair County. Youth Advisory Council (YAC) is a granting committee of the Community Foundation made up of St. Clair County high school-aged students that support programs that strive to improve the everyday life of the youth in the county. If you would like to seek a grant for one of these categories, please apply for funding here.